This article is part of a series called Design Illuminated, where I plan to explore and challenge what really makes certain games great (or not!) The point of this series is to provide deeper insight into games but to do it in a concise, understandable manner that isn’t bogged down with technical jargon. I hope you enjoy this entry! At a public matchmaking level, how does one go about fostering teamwork in an FPS? You could take the role-based approach of Overwatch, with frontline attackers, backline supporters, etc. This “forces” teamwork, for a lack of better words, but requires a high degree of coordination and cohesiveness that can be hard to find when you’ve only known your teammates for the last thirty seconds. Not to mention, its not unusual to deal with role oversaturation within a team. You can try “carry” if you really need to, but it usually only works when both teams play Overwatch in an unoptimal way, like its Call of Duty. A great example of how NOT to carry. That’s because Call of Duty essentially puts everyone in the same role: kill things. Though teamwork is still important (especially in modes like CTF,) there is less variance between the tools available to each player. However, this sometimes makes teamwork feel secondary; the motivators to stick together and move as a unit are sometimes outweighed by the sheer “carry” power (and accompanying glory) that a solo player can seize. High-level teamwork definitely helps, but isn’t always necessitated. This isn’t meant to call out Overwatch or Call of Duty; both are mechanically sound in what they set out to do most of the time, even if the player base tends to gravitate to a different style of play. But lately, I’ve found myself impressed with the solo-team balance of a different FPS: Titanfall 2. Its probably been said several times over that this game is an underrated gem, but its really grown on me in the last several months. Good matches often feel great, while bad matches feel tolerable. There is something that just feels liberating about the way Titanfall 2 is constructed–both from an individual and team-centric perspective–and there are several clever things I see the game do to make it work. 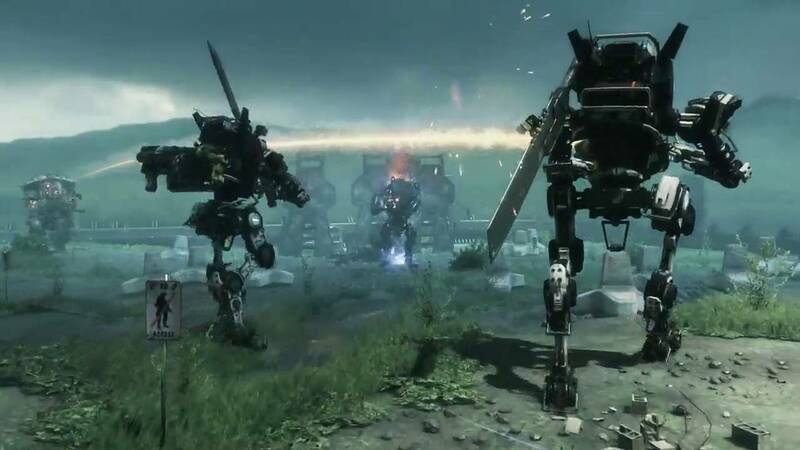 Titanfall (I’m going to omit the “2” from this point) has been referred to as “Call of Duty with giant mechs,” and frankly there is some truth in that statement. The standard modes start out as “generic” soldier squad fights, but sooner or later players should start earning and dropping their “titans” into battle. Thus, it turns into “Call of Duty with giant mechs,” though it should be noted that mechs are not like CoD scorestreaks and can be earned over multiple lives. Titans are more of an eventuality than a rare bonus. But beyond “mechs,” what exactly does make it different from the typical stroke of FPS games we normally see? One thing Titanfall tries to sell players on is mobility. Wall-running, baby! But between double jumps, speed boosts and grappling hooks, mobility in Titanfall is definitely not “on-rails.” There is a lot of room for creative, unscripted manuevers. As you might expect, the maps are built in a way to allow for increased mobility and freedom of movement, with most of them being large in scale when compared to player size. In this, I realized something: maps feel very unrestrictive in comparison to, say, the 3-lane structure often seen in Call of Duty. Although this normally means “staying in the action” is a bit more tedious, its offset by the fact that you can move so stupid fast. Why is this important? Whereas engagements can sometimes feel funneled into small chokes/hubs in other FPS games, Titanfall’s engagements feel like they shift fluidly and can engulf massive sections of the map. With the ability to move so freely and quickly, you can move into an attack position or off-angle from significant distance. Staying involved is fairly straightforward. Of course, modes with hardpoints or flags to defend will obviously centralize action a bit more, but generally speaking I’ve found there is a great degree of freedom to combat. The players–not static chokepoints–ultimately define where the action happens. Here’s the critical takeaway: larger, more dynamic engagement spaces mean that your team as a whole can stay unified and effective even with greater degrees of separation. Its exhilirating as a fast but loose deathball of pilots charge into the fray, quickly adapting and playing off of each other’s engagements. That’s not to say teamwork just “magically” happens, but that it can happen without having to feel claustrophobic or constricting. Get spawned halfway across the map? A few grappling hook shots may be all that’s needed to propel you right back into the action. That last part is also where the solo factor comes in. This playstyle only modestly hinders each individual’s freedom. Go from the top using grappling hooks, or sprint on the ground with a stim boost. Or rely on the strong core of mobility mechanics and go for cloaks and holographic decoys instead. There’s a streamlined feel to the pilot on pilot combat in this game that feels very on point. Of course, we’ve barely even started on the titans on which Titanfall stakes its claim to fame. The first thing to take note of is that games do not suddenly shift from being pilots vs. pilots to being only titans vs. titans. Titans are dropped throughout the match, and when they drop for each player depends on performance. Are you the first to drop your titan? Then you have an excellent chance to walk all over the tiny, little enemy pilots. This is another aspect of the game that brings a psuedo-carry role back to the individual. Titans are expectedly powerful, and each titan type can pretty much wipe up a pilot in a heartbeat. Titans are kept in check by strong player evasiveness and a host of anti-titan weaponry, but it doesn’t change the fact that the titans still hold the biggest baddest tools. And since everyone can reasonably expect to drop at least one titan per game, everyone has a chance to be the “big bad” or simply to shift the balance of power back into their team’s favor. Titans are, quite literally, game changers. But even with the concentration of power temporarily resting in the hands of one or two individuals, team play is still an integral part of the game. First off, we need to highlight that titans are bulky but exceptionally large targets. Remember when we were talking about large engagement spaces? The same concept of size applies here: a single pilot who knows how to use cover can wear down a hulking titan from significant distance, let alone a group of enemy pilots all peeking and poking at different angles. And what of titan on titan combat? Its far different than pilot on pilot combat for sure. Pilots are fast but frail: anyone who plays FPS games consistently has probably seen those multi-kill plays that are a sight to behold. When titans are involved, however, multi-kills (on other titans, that is) are not only uncommon but rare. Against each other, titans tend to play games of attrition rather than going for all-or-nothing plays. Even the “ultimates” they can charge up should be used precisely and discreetly, as those too can easily go to waste. By and large, friendly titans should stick together in much the same way pilots do. It doesn’t take long to learn that fighting 1v2/3/4 battles as titans is a very uphill affair. In a battle that requires wearing down an opponent, one titan is going to have a hard time matching the output of two or three. Even in instances where the one titan has a positional advantage, its not unusual for an enemy squad to simply rush them down; the single titan simply can’t put out enough damage to deter them. But battles that involve squads of titans squaring off? It can make for some fantastic encounters. I’ll say it again: titans are massive, obvious targets. Its not unusual for titan faceoffs to acclimate into larger ordeals because everyone wants to get in on the big-time action. In short, titans bring an amazing element of power to the individual player. Simultaneously, they create a very attractive rallying point for team-based warfare. As I wind down, I’d like to bring attention to one other mechanic that is a stroke of genius in Titanfall: battery stealing. Another way a pilot can wrest momentum away from an enemy titan is by hopping on its back and yanking out a battery, causing significant damage in the process. This is known as “rodeoing.” Pulling off a successful rodeo and subsequently escaping afterwards is something of a fine art, but very satisfying to get right. Not only that, but a successful battery pull significantly impacts the performance rating that summons your titan. Rodeoing is an exciting way to get your pilot in the fight and make a big difference. But it gets better. Want to be an even better teammate? Once you’ve stolen a battery, you can hitch a ride on a friendly titan and give it to them. This not only gives your ally more HP and “ultimate” charge, but grants you yet another bonus to your own performance rating. 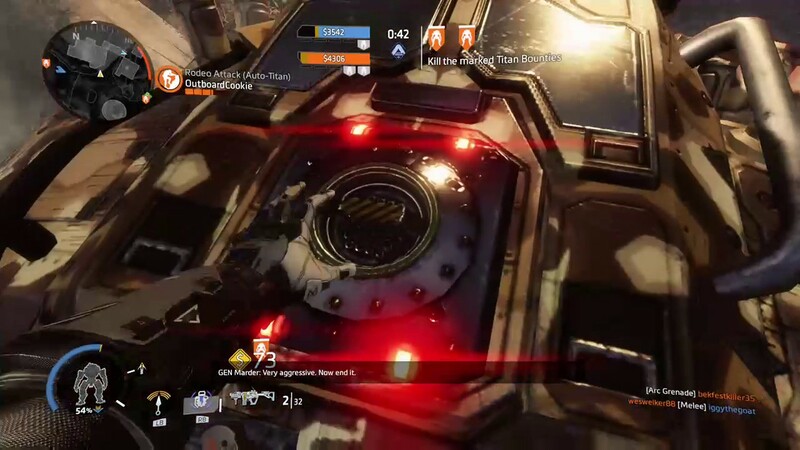 This mechanic very deliberately incentivizes teamplay and is a very tangible way to make an impact, particularly into the later stages of a match involving several titans. It really should be emphasized that in any team-centric FPS, having teamwork is always better than not having it. Even games that have high solo-carry potential, a cooperative squad will have a significantly better chance of beating a disorganized squad. The point of this article was to show how Titanfall keeps a lot of that individual empowerment while directly and indirectly pushing towards a more team-based approach. It certainly is no Overwatch, but that game struggles to foster teamwork even with how deliberate it is in its approach. 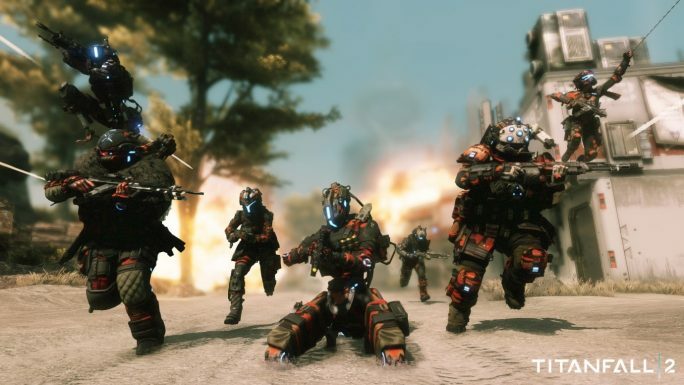 Whether teamwork is there or not, Titanfall does an excellent job of finding balance. Whether you’re running around as a pilot or inside a titan, you have a multitude of ways to affect a large swathe of different situations. As a pilot, you might be able to get your allied titan out of a sticky engagement with some well placed anti-titan rockets. As a titan, you could give a ride to your pilot teammates and act as their bodyguard. Simply put, Titanfall presents synergy in a compelling and exciting format.